Will the commissioners hear the message? A historic first meeting this week between the California Air Resources Board (ARB) and the California Transportation Commission (CTC), required by a law passed last year, produced no formal action plans. But it did demonstrate the disconnect between the perspectives of the two groups, who hold decision-making power over California’s transportation systems. And it underscored the need for the two to work together. The CTC is in charge of allocating most of the state’s transportation funding—about two-thirds of the overall transportation budget, which is currently about $35 billion (most of the remaining third is collected and controlled locally). While it has no direct regulatory or policy role, and neither suggests nor nominates the projects it funds, it does set criteria for choosing projects, as well as performance measures for them. It does this mostly through the creation of guidelines for Regional Transportation Plans (RTPs), the state transportation plan, and numerous programs funded by the recently raised gas tax, S.B. 1. The ARB is charged with overseeing air quality and climate regulations. Among its many tasks, it creates guidelines for Sustainable Communities Strategies (SCSs), which are part of RTPs. These sub-plans are supposed to get regions strategizing about how to encourage plans that reduce driving so the regions can meet state-set emission reduction goals. Several people at the meeting referred to the SCSs as a weak tool, and early indications seem to support that notion. The ARB is beginning to release very preliminary information it is collecting for its first report on the SCSs and on progress the state is making towards its climate goals. 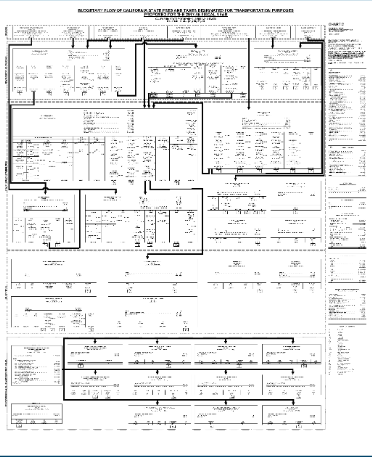 The report, required by S.B. 150, is due to the legislature in the fall. The results so far are not good—while California has experienced a slight decline in driving, it is nowhere near enough to reach the state’s 2020 goals, let alone stricter goals beyond that date. And early data also shows that the creation of the SCSs did not change transportation funding patterns at all. That is, overall local and state spending on roads and highways is about the same as it was before California decided it needed to shift transportation funding towards to more sustainable and healthy modes such as transit and active transportation. This comes with a caveat: ARB staff are still investigating whether a shift may have occurred in the very early years since the SCS process began, or whether a shift has occurred that isn’t showing up in their data yet. But these early findings underscore the need for, and the importance of, this week’s historic joint meeting: The environmental and climate goals California is trying to reach are being undermined by the way transportation investments are made. The meeting took place in a packed room, with the board members and commissioners mixed together in alternating seats around a large table. It kicked off with staff presentations about the work each body does and how they do it—including an unreadable slide with tiny numbers and arrows pointing every which way that illustrated, somewhat jokingly (but not really), how complicated the funding regulations the CTC must navigate are. ARB staff presented their findings about vehicle miles driven (VMT). Even if all the regulatory programs, incentives, and research the ARB has produced on low carbon fuels, clean energy, and zero emission vehicles could be put into effect tomorrow, California would not be able cut emissions enough to meet its goals, they said. Californians must also reduce VMT to 25 percent of 2005 levels, said ARB staffer Ashley Georgiou, which is equivalent to about 1.6 miles per person per day. “Reducing driving, including via carpooling, improving connections to transit, and increasing active transportation, can reduce health risks, reduce the need for funding, and strengthen the resilience of people and communities,” she added. Members of the CTC didn’t seem to believe her, although Chair Fran Inman told the group that they had hosted a discussion about VMT at their monthly meeting that very morning. ARB staff has the expertise to answer these questions. They have issued numerous reports on their findings, and included them in the cap-and-trade scoping plan that commissioners did not seem to be familiar with. This would be a good topic to take up in future meetings. At this meeting, members of the two groups seemed to talk at cross-purposes. Commissioners focused on economic concerns, while board members repeatedly reminded everyone that health outcomes were just as important. “We’re just coming at it from different angles,” he said. They did seem to agree that, although the meeting was well-attended, there were certain sectors missing from the conversation. It is not really possible, said ARB member Phil Serna, to talk about land use and transportation if there isn’t also representation from the housing sector. Several commissioners agreed, saying housing builders could share information about their obstacles and challenges. Business and labor interests also weren’t present, it was noted. To that should be added the media. There didn’t seem to be any reporters present, save for this one, and there hasn’t been any news coverage of the meeting. People don’t seem to understand the significance, let alone the urgency, of bringing together and coordinating different state goals under one roof. There are a lot of goals to consider. The people who did show up to speak introduced a wide range of issues that are affected by the way transportation is planned, funded, and deployed in California. They made suggestions on topics from improving public outreach to protecting Californians from displacement to incorporating transportation justice principles into decisions. Robert Phipps, from the Fresno Council of Governments, stressed the importance of finding the right focal balance between health and prosperity. He described extensive outreach work FresnoCOG has done that showed them that residents overwhelmingly want walkable, bikeable, safe communities with good transit options. Many of the speakers highlighted the importance of the ARB’s findings on VMT. They reminded the board and commissioners that adding lane miles, in the long run, creates more traffic and more congestion, not less—and that reducing VMT doesn’t necessarily mean reducing the amount people travel. “California is ready for a change,” she said. The one action item produced by the gathering was an agreement between the two chairs and their co-chairs to meet and find some topics they could work together on. Susan Branson, executive director of the CTC, had suggested a few topic areas, and her suggestions were echoed and expanded on. Several commenters also floated the idea of forming a smaller work group, to include members of the public, to help focus the discussions and define the issue areas where coordination would be most beneficial. That idea was echoed and supported by several board members. The next joint meeting, as required by A.B. 179, will take place in December. By then, the question of whether the gas tax will be repealed or not will have been settled, one way or the other. Whichever outcome occurs, it is likely to affect the content of these ongoing conversations between the California Air Resources Board and the California Transportation Commission. 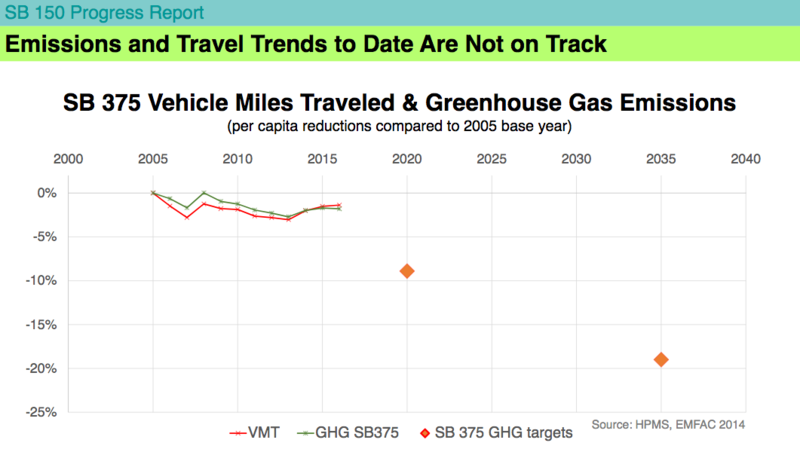 I believe what ARB staffer Ashley Georgiou is referring is the 40 percent GHG reduction by 2030 mandate set in SB 32, and what ARB determined the contribution of VMT reduction should be (in addition to that coming from low carbon fuels, clean energy, and zero emission vehicles, as stated in article). Then perhaps you’ll find media outlets other than Streetsblog begin to take notice. Kudos to Melanie! Are we talking about 25% of 2005 levels, or 25% less than 2005 levels? What year is this a target for? People driving all the way in from Modesto and vicinity–just fine with them. If they want to know where all the emissions came from, they should look in the mirror. When will someone bring up the elephant in the room? That being that these state “goals” were never attainable, and never expected to be. What they were was political grandstanding by governers and legislators, wanting to upset the status quo. The notion that we will redefine our society and our state in pursuit of mission-impossible “goals” isn’t realistic. We’re moving in the right path, but the goals never had real support or viability, and this was acknowledged at the time. 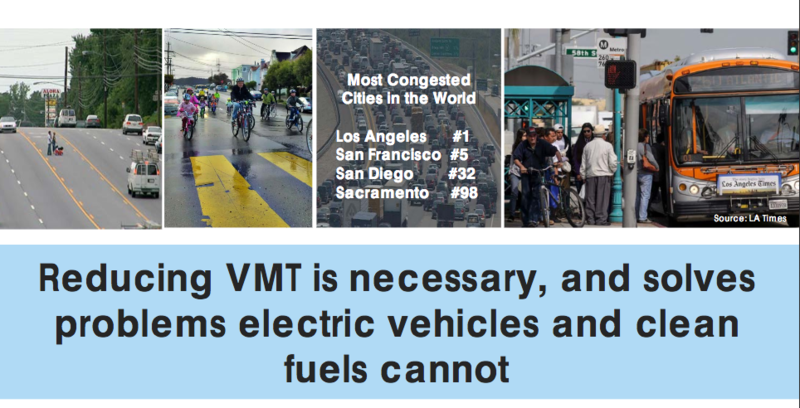 “Californians must reduce VMT to 25 percent of 2005 levels.” So what happens if the goals aren’t met? Will Big Brother come and take away your car keys? Will your engine automatically shut off after you have driven your quota of miles? What sort of teeth does CARB have to make this happen? The CTC approved $1.8 billion in allocation requests for highway projects--which includes $3.5 million for Active Transportation Program project--and $156 million for transit projects.